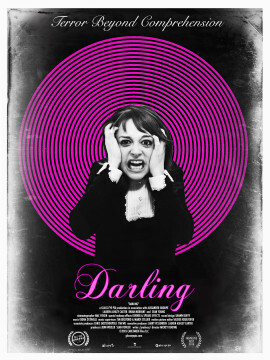 Darling (B+), the fourth feature from Pod’s Mickey Keating. Lauren Ashley Carter (Pod, Jug Face) turns in a mesmerizing performance as Darling, an anonymous woman in an indeterminate year who takes a care-taking job in an elegant New York townhouse. On her way out the door, the owner tells Darling that there have been rumors about the house and its former caretaker, who committed suicide. But, she assures her, “nothing like that could ever happen again.” Shot in gorgeous black and white, this pseudo-Satanic riff on Repulsion and The Shining uses minimal locations and minimal characters; Sean Young and Larry Fessenden provide genre cred in small roles, but Carter is alone on screen for most of the movie. Her breakdown (or maybe it’s a possession?) is underscored by jarring sound effects and flashy editing tricks that, applied incorrectly, could seem pretentious. But here, they work, because they actually makes sense in the context of the story. Deeply unsettling, with flashes of extreme violence, Darling is a ghost story with no ghost, just Carter’s intense eyes, expressive face, and an ominous white door at the end of a hallway.